thanks for stopping by, I love your birdhouse. I also love your daffodil post, may I borrow the poem? I like the rustic way bird houses look, I just hope nothing freaky flies out. As long as I am credited as the author and there is a link back to my blog, I’m fine with that. Thank you for the compliments. I need to find a bird house still! I want a hummingbird feeder this year too! Come on over and link up! Check out the post above to check out all the amazing giveaways all over blogland right now! If you have one feel free to add in! 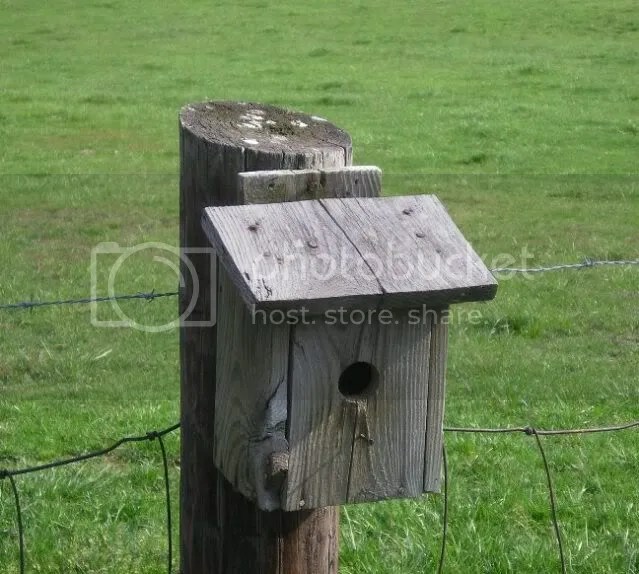 Does the birdhouse have any residents? Nice shot — I like the weathered look. Probably a bluebird house?? Ah, but have any birds made it their home yet? Hi Izyjo, what a delightful series of posts. The bird house looks like it would make the perfect home for a pair of young parents. The daffodil photo and prose was superb. The storm warnings are scary. I believe you in the middle have a tougher time of it than where we are along the foothills of the mountains along the NC border. I am from Oklahoma originally, and that is a place with storms and plenty of them. Sort of thrilling in a way, I miss that lightning flashing across the sky like fireworks on a summer night, heat lightning. I miss the rumbles of thunder and the rainbows that follow. The flat land means you can see the sky for many miles. Homesick for OK? No, just remembering. Hello, Frances thank you so much for the compliments. As a Northerner, I have never encountered such windiness. It can be quite terrifying. I love heating lightning too. I remember staying awake in my bed at my grandparents house to look out at the light show. A humming bird feeder is a great idea! They are amazing to see. I will check out your blog. I think there may be. Hope fully good nice bird. Not those rotten cat birds who lay parasitic nests. Thanks for stopping by VP. Thank you, Beth. Very good! How did you know we have bluebirds?